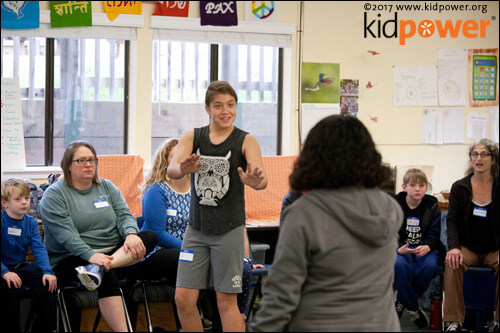 Learn how to teach Kidpower’s empowering and effective self defense skills to teens and adults! Use these cartoon-illustrated lessons, showing how to avoid and escape from attacks, to teach important, practical, and effective self-defense skills to youth and adult students. Available now on Amazon and on Kindle! • Awareness and target denial to avoid an assault. 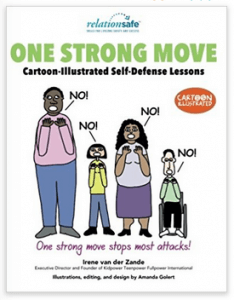 • Physical self-defense skills to escape from an attack. • Defense against weapons, chokes, punches, and multiple attackers. • Verbal self-defense tactics to deescalate a confrontation. List price: $19.99 USD. Contact safety@kidpower.org for discounts on orders of 20 or more. Kindle format available for $5.99! In 1985, author Irene van der Zande protected a group of eight young children, including her own two, from a man who was threatening to kidnap them. This frightening experience led her to take her first self-defense class and then to work with experts worldwide to establish Kidpower Teenpower Fullpower International in 1989. Kidpower today is a global nonprofit leader in protecting people of all ages and abilities from bullying, violence, and abuse through awareness, action, and skills.